We thought that you might like to see some of the feedback that we receive about YummyMath. Check out the article: Yummymath has Yummy Ideas by Education Shift. - "An incredible resource that connects current events, sports, food and interesting topics to math lessons." Are You Ready for Some Football? 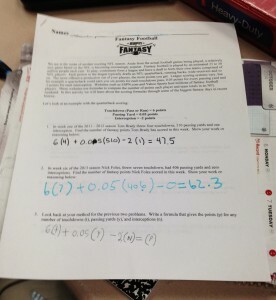 Fantasy Football Math ProjectPosted on October 7, 2014 - This week, we kicked off our fantasy football project in Pre-Algebra. This is my absolute favorite project! The kids get excited, I get excited, and we have a lot of fun competing against each other while learning to work with formulas and spreadsheets. I used a Yummy Math activity to introduce the project and get my students used to how scoring in fantasy football works. I like how this activity walks students through a couple concrete examples and moves them to writing a formula. I changed the formula for the project this year to reflect the one used in this Yummy Math activity. "Making mathematics relevant to students is a challenge that a lot of teachers face.Yummy Math could be a good place to find some help making mathematics relevant." - Richard Byrne, Free Tech for Teachers.